• ±0.5°C accuracy from -10°C to +85°C. • Measures temperatures from -55°C to +125°C (-67°F to +257°F). • Unique 1-Wire interface requires only one port pin for communication. • Each device has a unique 64-bit serial code stored in an onboard ROM. • Multidrop capability simplifies distributed temperature sensing applications. • Alarm function with user-defined nonvolatile alarm settings. • Converts temperature in 750ms (max.). • Requires no external components. 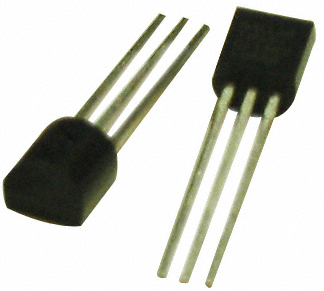 • Power supply range is 3.0V to 5.5V.